Note : I am posting the progression of these Alice pieces, start to finish. 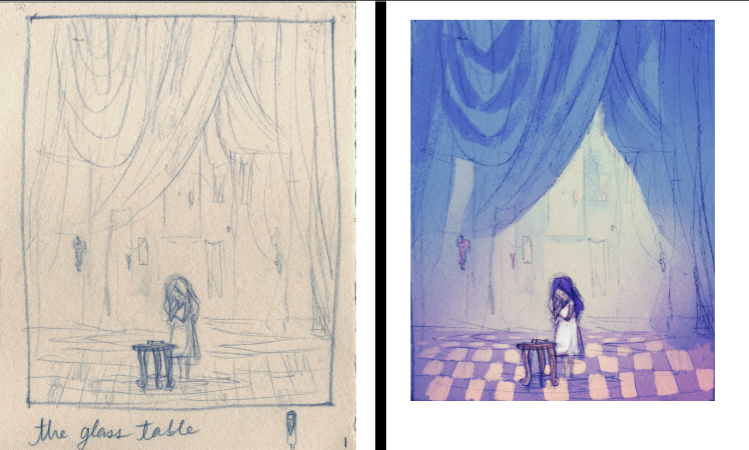 This stage is the rough + color study. 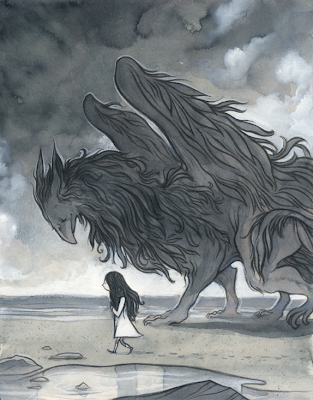 "They very soon came upon a Gryphon, lying fast asleep in the sun. 'Up, lazy thing!' said the Queen, 'and take this young lady to see the Mock Turtle, and to hear his history. I must go back and see after some executions I have ordered'; and she walked off, leaving Alice alone with the Gryphon. Alice did not quite like the look of the creature, but on the whole she thought it would be quite as safe to stay with it as to go after that savage Queen: so she waited. The Gryphon sat up and rubbed its eyes: then it watched the Queen till she was out of sight: then it chuckled. `What fun!' said the Gryphon, half to itself, half to Alice. 'Everybody says "come on!" here,' thought Alice, as she went slowly after it: 'I never was so ordered about in all my life, never!' "
This one is interesting in that I've already had a little practice with it, you might say. 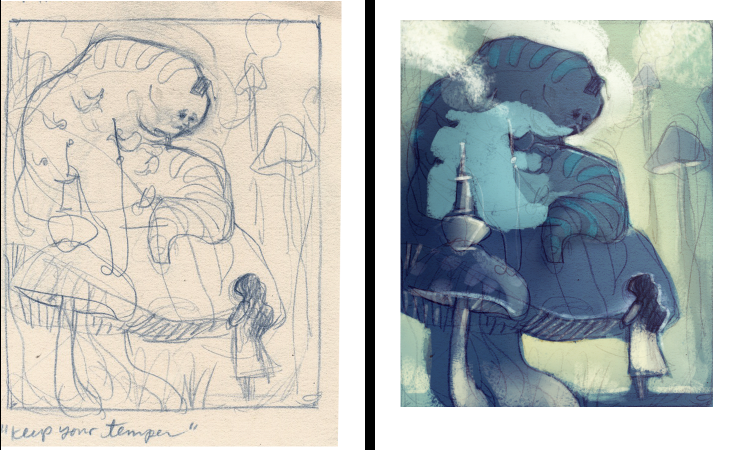 I took this thumbnail to completion back in February for the Gallery Nucleus Alice show, "Curiouser and Curiouser" I did the piece at 8x10 so, due to the size, it was difficult to get some things right. Things weren't meant to be drawn small. All of these new pieces are 11x14, a much more agreeable size to my hand. Here is the piece that went to the show. Next post, Monday : "What is his sorrow?" "First came ten soldiers carrying clubs; these were all shaped like the three gardeners, oblong and flat, with their hands and feet at the corners: next the ten courtiers; these were ornamented all over with diamonds, and walked two and two, as the soldiers did. After these came the royal children; there were ten of them, and the little dears came jumping merrily along hand in hand, in couples: they were all ornamented with hearts. 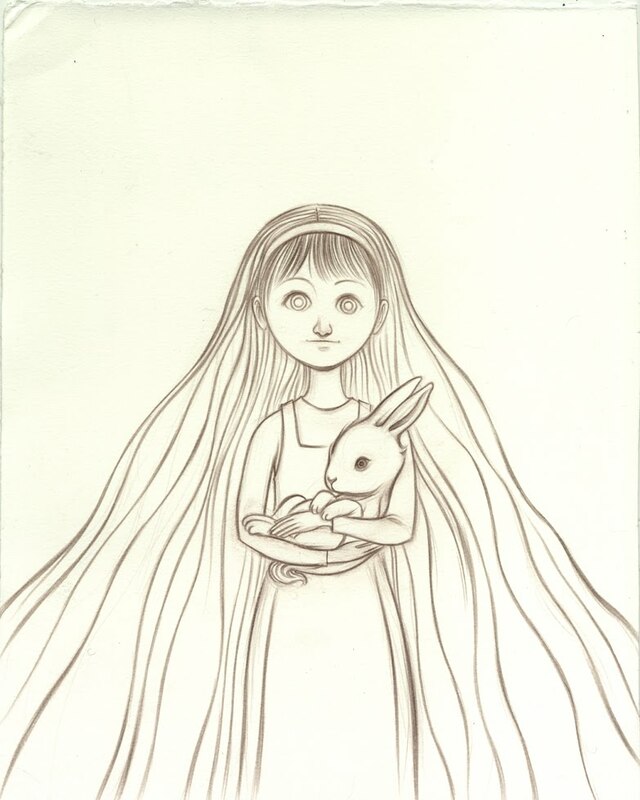 Next came the guests, mostly Kings and Queens, and among them Alice recognised the White Rabbit: it was talking in a hurried nervous manner, smiling at everything that was said, and went by without noticing her. Then followed the Knave of Hearts, carrying the King's crown on a crimson velvet cushion; and, last of all this grand procession, came the King and Queen of Hearts. Alice was rather doubtful whether she ought not to lie down on her face like the three gardeners, but she could not remember ever having heard of such a rule at processions; `and besides, what would be the use of a procession,' thought she, ;if people had all to lie down upon their faces, so that they couldn't see it?' So she stood still where she was, and waited. I'm pretty pleased with the color comp for this one. It came together after the pink sky. I'm looking forward to drawing this one. 'You should learn not to make personal remarks,' Alice said with some severity; 'it's very rude.' "
Next post, Thursday : "Nonsense!" So she set the little creature down, and felt quite relieved to see it trot away quietly into the wood.' If it had grown up,' she said to herself, 'it would have made a dreadfully ugly child: but it makes rather a handsome pig, I think.' 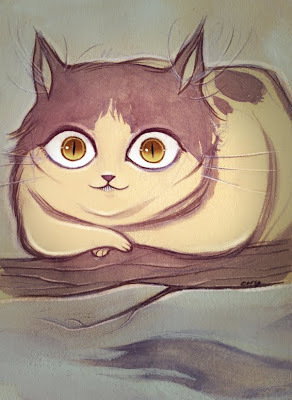 And she began thinking over other children she knew, who might do very well as pigs, and was just saying to herself, 'if one only knew the right way to change them--' when she was a little startled by seeing the Cheshire Cat sitting on a bough of a tree a few yards off. Pretty straightforward, perhaps a little too green, but I'm pleased with the value study. Again, thank you all for the comments, I'm so glad to see that these progressions are helpful and enjoyable. Just wait until we get to the painting, then the fun is really going to start. Next post, Wednesday : "Your hair wants cutting." This is one of the pieces I've most looked forward to making. I'm pretty pleased with the idea. In real time update : Since this is an on-going project, building on stage after stage, I'll update you guys from time-to-time with where I'm at in real time. 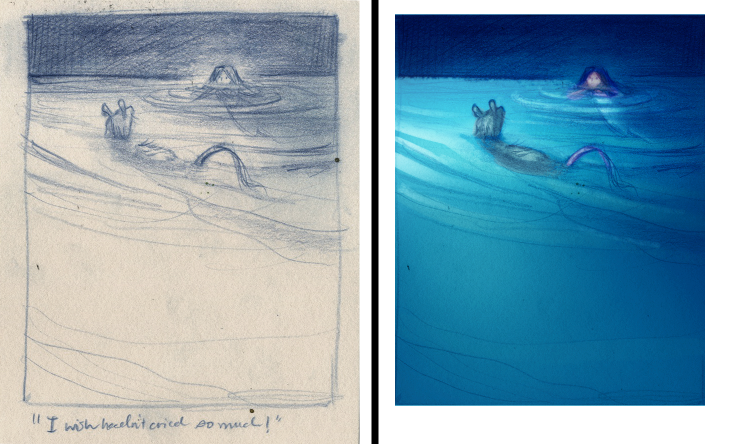 Last night I finished my "blue pencil drawings" for the first 6 final drawings. Typically I work in roughs/color studies (like above) from there I begin the final drawings with a lightly rendered blue pencil drawing. I get down all my shapes and everything and from there move on to the final drawing. 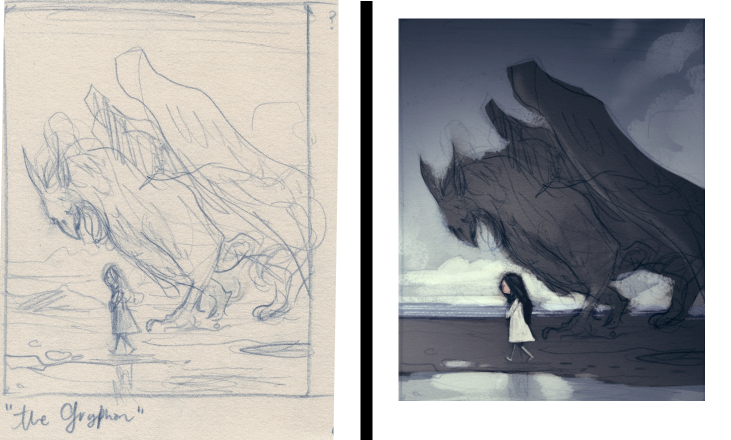 I always wonder how much preproduction, development work people would actually be interested to see, specifically whether or not it's even worth posting these little roughs/color studies. Does anybody get anything out of them? Is it aggravating to be on a weeks long journey, getting little snippets of pieces but not the payoff of a finished piece for weeks? Corey, I'm seing your rough sketches, and crazy lines with some througts hidden, and it's all just awesome, really. I'm kinda of an artist-wannabe ang get amazed by your works. just keep on posting it, please. Maybe it's not much for you, but every single day I open your blog, see rough sketches or finisher masterpieces, it gives enough motivation to keep drawing and learning the rest of the week. I post all that to say, I hope these are helpful for you in someway, to get a glimpse into the process I typically work with. Maybe it would work for you too. This seemed to Alice a good opportunity for making her escape; so she set off at once, and ran till she was quite tired and out of breath, and till the puppy's bark sounded quite faint in the distance." Well. All that said, the rough is very rough. I don't even know if it makes sense to anyone else. I'm almost not sure why I'm showing all these roughs, since the payoff for them won't be for weeks, but nonetheless, I've started so here we are. Again, I do think of this blog as a workbench that anyone can come over and take a look over my shoulder so in that respect it makes sense. I do hope you'll hold fast until the reveal of the final art. Then they all crowded round her once more, while the Dodo solemnly presented the thimble, saying 'We beg your acceptance of this elegant thimble'; and, when it had finished this short speech, they all cheered." 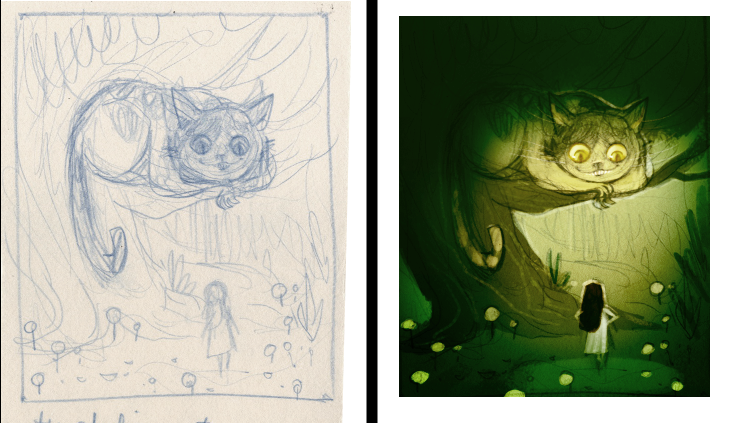 I am posting the progression of these Alice pieces, start to finish. This stage is the rough + color study. "As she said these words her foot slipped, and in another moment, splash! she was up to her chin in salt water. Her first idea was that she had somehow fallen into the sea, 'and in that case I can go back by railway,' she said to herself. (Alice had been to the seaside once in her life, and had come to the general conclusion, that wherever you go to on the English coast you find a number of bathing machines in the sea, some children digging in the sand with wooden spades, then a row of lodging houses, and behind them a railway station.) However, she soon made out that she was in the pool of tears which she had wept when she was nine feet high. Just then she heard something splashing about in the pool a little way off, and she swam nearer to make out what it was: at first she thought it must be a walrus or hippopotamus, but then she remembered how small she was now, and she soon made out that it was only a mouse that had slipped in like herself." "Suddenly she came upon a little three-legged table, all made of solid glass; there was nothing on it except a tiny golden key, and Alice's first thought was that it might belong to one of the doors of the hall; but, alas! either the locks were too large, or the key was too small, but at any rate it would not open any of them. However, on the second time round, she came upon a low curtain she had not noticed before, and behind it was a little door about fifteen inches high: she tried the little golden key in the lock, and to her great delight it fitted!" Alice in Wonderland has been done so many times by so many brilliant artists that I think the temptation can go both ways -- an illustrated moment works so you go with that even if it's familiar. It's worked for 150 years because it's good. Or you go the complete unconventional route. Which I'm sure some people to make work but for me that felt like I was trying too hard, it needed to be more natural. What I've tried to do with all of these pieces is strike a balance between familiar characters and moments and other moments, like the Glass Table, that I don't remember ever seeing illustrated before. Either way it's terribly difficult to go wrong with subject matter as captivating as this. 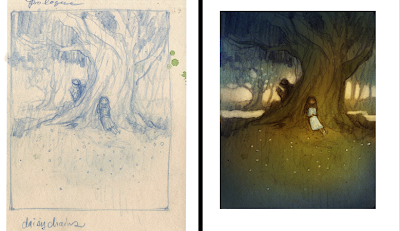 Here's an alternate coloring study for this one. 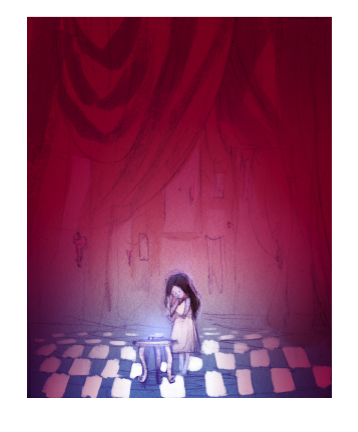 It's possible for this one that when I come to drawing the final I think I might tighten up the focus on Alice and the table, bring it in a little closer. Next post, Wednesday : "I wish I hadn't cried so much!" 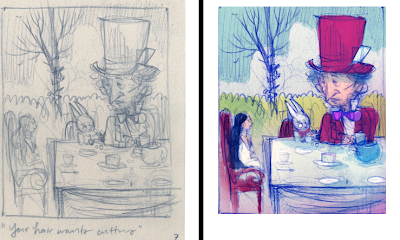 Back in October of last year I began putting together roughs for my next personal project, illustrating Alice in Wonderland. After many weeks and months of sitting on the back burner, Alice has finally come to front. I've spent some of my free time these last few days taking the completed roughs turning those into color studies. Every day (weekday) for the next couple of weeks I am going to post the next rough/color study in the series. After that we'll move on to the drawings, and finally the paintings. I hope you will enjoy. I've put together 14 illustrations : 12 chapters illustrations + prologue and epilogue pieces. 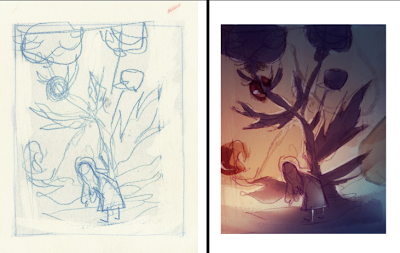 So, without further ado, here is the rough and color study for the prologue. Next post, Tuesday. "The Glass Table"
Rep's new site + animation I show you in confidence. 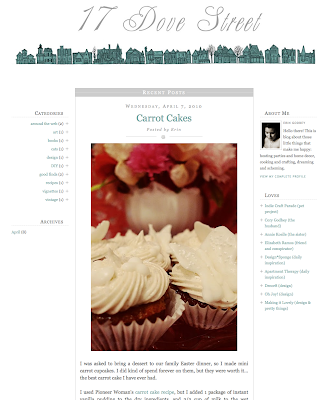 First of all, my rep, Matthew Silver, has got a new site! Check out me and my friends. Now below is a piece of animation you'll find on the site. It is not complete. Truthfully Danny and I were working on it when the massive client animation project (remember me talking about that way back when? I still haven't gotten the final word about posting it yet, sorry) so all that to say, it's really one of our first passes at this method of animation. We've since worked on two more large client animation projects and we're looking forward to going back and revisiting this. I mean, it's nearly a year old. You'll see the problems, no doubt, just understand it's a work in progress. I show you this the strictest of confidences. It's basically a workbench. It's a table I set up in the middle of the internet and anyone can come over and take a peek at the work that's going on with me both professionally and personally. 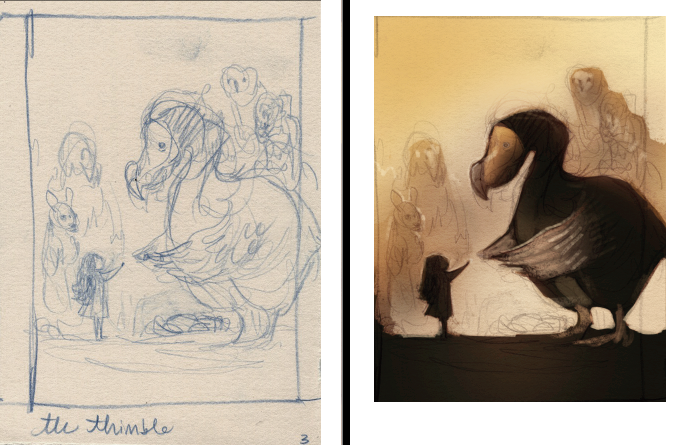 I show paintings in stages, why not show animation in stages. I think it's the progression of things that I enjoy seeing on other people's blogs. Oh yeah! And Danny McNight, Portland Studios animator has got a blog now! Read it and weep. All these last few posts feel like the calm before the storm to me. They've all been small, minor updates -- but -- in the next few weeks I've got several series of posts; a July feature (a two week long series on a theme) Alice oil work, series of posts about my Flight 7 story, the massive animation project (whenever I get permission for it, incidentally it was for Prudential) and of course all the new work for San Diego Comic-Con 2010. It's a busy next couple months. Pull up a chair. Not a large post today, or anything all that significant, just a few doodles from last night. And a hobbit in the second page. I think it looks like Sam. 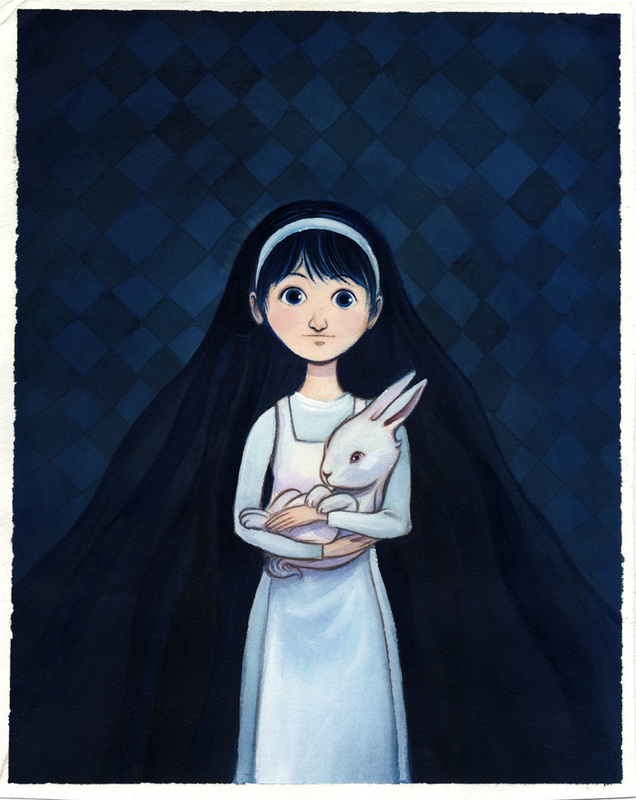 Also, I've got my "Alice" prints in and they turned out very nice. Of course they don't photograph very well through the plastic sleeve. All the same, if you'd like one you can find them here. Only 14 left. Here's a scan of the piece and a much more true indication of the colors and values than the above photograph. has landed. 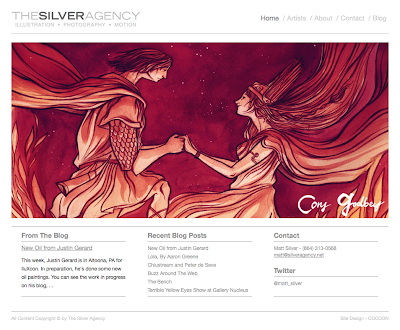 I created the banner illustration of houses and did what I could to help make the blog. Not only does Erin design rooms that are wonderful to be in, host great parties, and cook wonderful food, she's also funny. She has amazing color sense, an eye for good design, and great taste. Plus, she gets this attitude about her when she gets around machinery or technology that makes me laugh a lot. She'll be posting about books, gardening, home decor, design, recipes, event planning, projects she has... the list goes on and on. Things that I, initially, might take for granted, but when viewed through her lens and her blog take on such an admirable quality and life. All that to say, 17 Dove Street, is a great place that I'm going to hang out. I hope you'll take a moment to stop by. Here's a little larger view of a slice of the houses. They were fun to do. Well! We've finally arrived at the end of this excursion into Acrylic and watercolor washes. Again, overall I'm very pleased with the way it works and I see working like it more in the future. Towards the end I started messing around with it and doing things I ought not (painting gouache and then Acrylic on top) ought not, in the sense that it made it more difficult than it needed to be, an Acrylic wash wouldn't come up but a gouache wash would so I had to deal with that. Lighting isn't the best in the above piece, it's a little dark. This is much more accurate, color and value-wise. Here's a scan of the piece. And since it's been way too long since I've posted anything new to my shop so I've got a limited run of this piece, only 15 of them. Also, here's a link to the original painting available on my shop. Ok, so we're getting close to wrapping this little experiment up. It's been an enjoyable method to play with and I can see doing more with it in the future. The color is just a touch richer in the original, in these photographs the paint was still wet and shiny. My goal is to have this complete by Friday's post, I think that's pretty doable. The next few steps are to paint in the lighter squares with white gouache and a few more over all washes. And this is the little piece I just got got from Jordie Bellaire. She is a real good drawer, you should check her out. This is a small book of poetry I had the pleasure of illustrating sometime a several months ago. It was one of those enjoyable rediscoveries when they showed up because I think the illustrations work well, especially in the slightly smaller format. There are 14 interior pieces in total. It's a great looking little book designed by my friend Matt Mantooth. And this is the small piece I bought from my sister-in-law, Annie. You should just go ahead and do yourself a favor and buy a painting of hers. 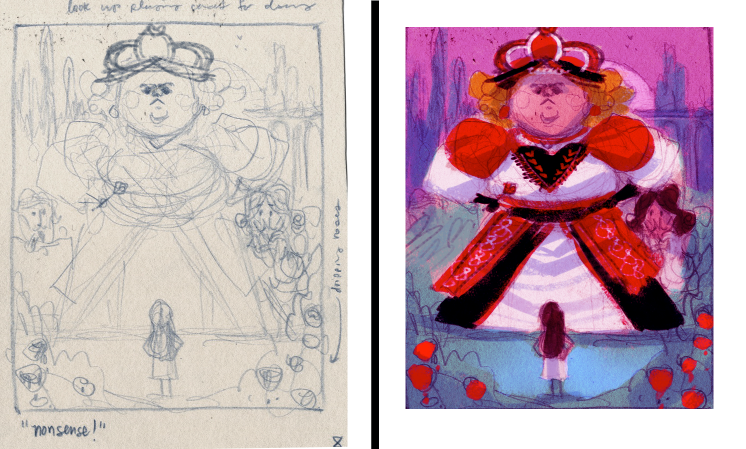 I've got a big deadline (due today) that I've been working toward so I haven't made much more progress on that Alice test piece from the previous two posts. Instead for today here's a quick photoshop piece that I did the other night. I don't know if you've seen but a friend of mine Bobby Chiu does these great interviews and giveaways. 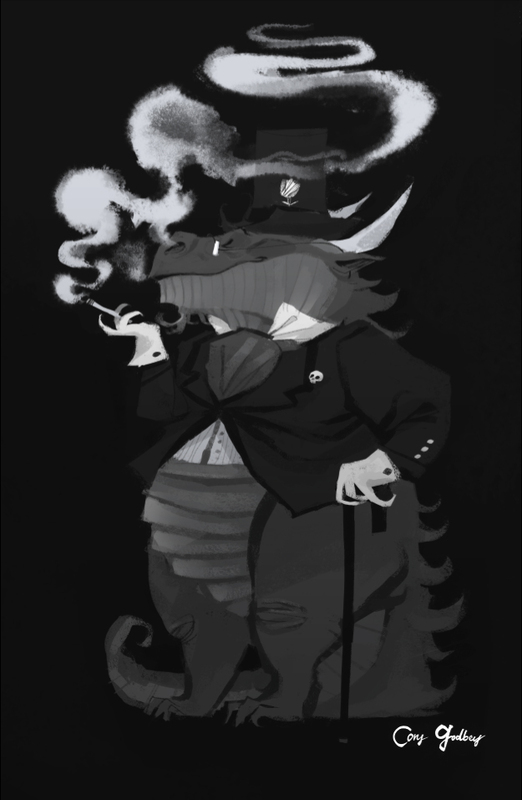 The theme was "Goth Dragon." I don't have too much interest in goth but Victorian, that's practically the forebear of goth right? So I did a Victorian dragon. 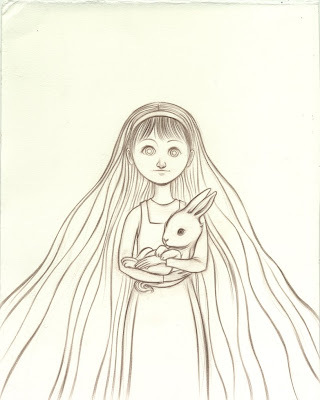 Monday I'll have the completed Alice piece to post. It's progressed more since the last post on Wednesday but I don't think enough to warrant it's own post. Also, April marks the month that I am going to begin my Alice pieces for my next personal project. 14 pieces, 12 chapter illustrations + a prologue and epilogue. I should be able to start these up this next week.